Aboriginal Artwork of Tropical Australia Earns International Acclaim! The best of Australian aboriginal artwork is much sought after internationally. Australian aboriginal dot art from the Central Desert, Australian rock art from the Kimberleys and Arnhem Land and the amazing head-dresses from the Torres Straits are well known, with famous collections of these art forms housed in the Australian National Art Gallery. But the indigenous art from Far North Queensland is only recently finding its place on the world stage. Of particular interest is the work from the “Lockhart River Gang” a group of young, energetic painters. Named a “gang” from their origins as a “work for the dole” group, this relatively new Australian aborigine art movement has received much encouragement, training and public funding. Well promoted and provided with brilliant exhibition opportunities, the dozen or so young people have developed a well-deserved reputation for excellence. Rosella Namok, Fiona Omeenyo, Samantha Hobson and Silas Hobson are amongst the best known of the artists, who live in a very isolated area, about eight hundred kilometres north of Cairns. They mostly paint on canvas with acrylic but are also competent printmakers, producing either screenprints or linoprints at the art centre at Lockhart River. Amongst their North Queensland teachers have been Cairns artists Anne and Ron Edwards and Arone Meeks. In Cairns, Theo Tremblay, from Editions Tremblay, mentors many of the promising young indigenous artists from the Torres Strait Islands and Cape York communities. Women tribal elders from the community still produce baskets made from lawyer cane, palm, paper bark, pandanus or grass as well as necklaces from shells and seeds. At Mossman, close to Port Douglas, the well-respected elder, weaver, Wilma Walker kept alive one of the most traditional types of aboriginal artwork of the tropical rainforests. Although Wilma taught the weaving of beautifully shaped baskets, made from the rare black palm to all those who were interested, she regretted that few of the younger generation were interested in such a labour-intensive pastime. 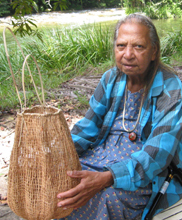 Born at Mossman Gorge, Wilma remembered the men of her family making fish traps and bi-cornal baskets from lawyer cane. Carried by a vine strap across the forehead, the baskets were used for carrying yams, fish and fruit. The Deeral community still makes these on occasions but the art seems to have died out in other centres. Sadly (2009) Wilma has passed away and, although some of her grand-children have learned her skills the passion for this particular form of aboriginal artwork does not appear to be there. But they are young and have many exciting opportunities before them. Perhaps, in years to come, they will value the retention of their living culture and will revive these weaving skills. n Cairns, Arone Meeks works as a sculptor, painter and printmaker, making commentary on social issues pertaining to aboriginality. Along with other graduates from the Cairns Aboriginal and Torres Strait Islander visual arts course, he is active in Cairns art circles and exhibits world-wide. One such TAFE graduate is Norman Miller (Munganbana) who comes from the mountainous, rainforest region inland from Cairns (his name “mountain water” derives from the many lakes and waterfalls in the green and fertile Tablelands area of his homeland). Norman is a painter (he won the Sheraton Mirage Open Prize in 2006), who tells ancestral stories in paint, but who also produces charming lino prints of animals of the region – the shy platypus, fresh-water turtles, lizards and pythons which inhabit the fringes of deep volcanic lakes. A potter/sculptor of great note is Thancoupie. Originally from an area near Weipa, Thancoupie, sadly now deceased, was highly respected as an artist and teacher of her people. Her work is in many prestigious collections. For an interesting overview of Australian aboriginal art please see the National Gallery site.